The Peloponnesian War was one of the greatest conflicts in the Classical World. It was a conflict that involved the Athenian Empire and its allies in a brutal struggle with Sparta and the Peloponnesian League. The war lasted almost three decades (431-404 BCE) and was to change the Greek world. Perhaps one of the most important events in this was Athens Sicilian Expedition (413-415 BCE). The Athenians sought to conquer the island of Sicily. This expedition resulted in a disastrous Athenian defeat that is seen as a turning point in the Peloponnesian war. Prior to the expedition, Athens held its own against Sparta and maintained its Empire. However, the disastrous Sicilian expedition severely weakened Athens and exacerbated existing domestic tensions in its society. The combination of a military disaster and internal dissent ultimately led to the defeat of the City and the loss of its Empire. In the aftermath of the Second Persian Invasion (480-479 BCE), Athens emerged as a great power in Greece. The city-state and Sparta had led the Greek world against the Persians. In the aftermath of the Persian defeat, Sparta for internal reasons ended its participation in the war against the Persians. Athens continued the struggle against Persia and established the League of Delos. The Athenians eventually turned the League of Delos into an Empire which was possible because Athens possessed the largest navy and most powerful navy in the region. When Athens issued the Megarian Decree, Sparta responded by invading Attica. This led to total war between Athens and Sparta. 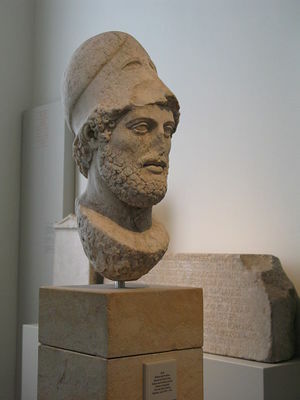 Athens followed the strategy of Pericles. The Periclean strategy urged Athens to avoid a land war with Sparta and to concentrate on its navy and to avoid other entanglements. Despite the death of Pericles early in the war, during a plague, his strategy was followed for many years. Sparta and its allies were unable to defeat Athens and indeed the Athenians inflicted a humiliating defeat on Sparta on the island of Pylos. This led to a truce between the two most powerful Greek city-states and this eventually to the so-called Peace of Nicias. Athens was as powerful as ever and it seemed that if it followed Pericles strategy that it was invincible. This was all to change with the Sicilian Expedition. Athens was a radical democracy and every male citizen could vote on matters such as the declaration of peace and war. Its political system energized the Athenians and made them very formidable. However, Thucydides, a former Athenian general believed that Athenian democracy was flawed and lead to aggressive and dangerous policies. Thucydides argued that Athenian democracy encouraged the Sicilian Expedition. When Sparta and Athens agreed to the Peace of Nicias in 421, the Athenians were at peace for first time in years. Instead of using the peace to re-build their strength the Athenian popular assembly voted to send an expedition to Sicily, to conquer the island. Many believe that the expedition was doomed from the start as the Athenians failed to consider the sheer scale of the challenges involved in conquering Sicily. When the Athenian navy arrived in Sicily they had some success. This large and rich island was divided among several Greek city states in the center and east of the island. In the west of the island, the Carthaginians had established several large settlements. At first, the expedition went well. Several cities allied themselves with the Athenians. However, soon the Athenian generals quarreled among themselves. Eventually, they agreed that they would attack and seize Syracuse which was the greatest Greek city-state in Sicily. Alcibiades urged caution and wanted the Athenians to find more allies before it attacked the great city of Syracuse. Syracuse was led by a very capable politician and general Hermocrates. He acted swiftly and established an anti-Athenians coalition among many Sicilian city-states and allied Syracuse with Sparta and the Peloponnesian League. Despite this, the Athenians secured much of the east of the island of Sicily after defeating a Syracuse army. Hermocrates, whom Thucydides likened to Pericles, then prepared his city for a siege and persuaded several Athenian allies to remain neutral. Now, there was a scandal in Athens and Alcibiades was implicated in it. He was charged with impiety and was summoned back to Athens, he refused because he feared for his life and fled. This was a blow to the expedition because he was arguably the competent Athenians general. Nicias was then put in control of the expedition and decided to besiege the city of Syracuse. He had the Athenian army build a string of fortification around the city and used the large Athenian armada to blockade the city by sea. The Athenians tried many times to take the city but each time they were beaten back. They could receive reinforcements under the general Demosthenes. Hermocrates could secure support from Sparta and their allies. Despite this, the Athenians could continue to besiege the city. In 413 BC, the Spartans suspected that the Athenians had overextended themselves declared war on Athens and ended the Peace of Nicias. This meant that the Athenians could no longer send reinforcements to Sicily. 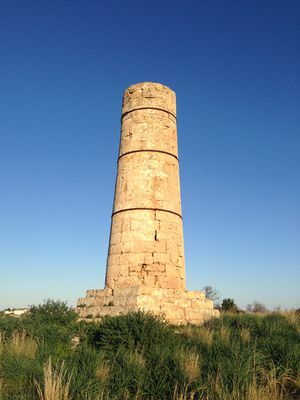 One by one Athens allies in Sicily abandoned her. 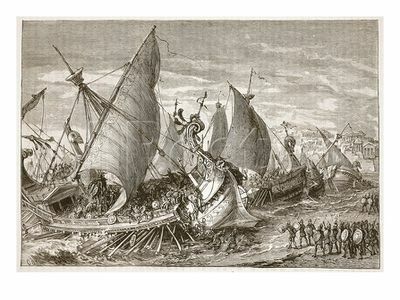 The army and the navy under Nicias continued the siege but with Spartan support, the Syracuse’s launched a counter-attack and their ships defeated the Athenian navy. The Athenian army raised the siege after the Syracuse Navy defeated the Athenian fleet. Nicias ordered a retreat and in a subsequent battle at the River Anapus, the retreating Athenians were almost annihilated. Thucydides describes the defeat graphically ‘At last, when many dead now lay piled one upon another in the stream, and part of the army had been destroyed at the river, and the few that escaped from thence cut off by the cavalry.’ Those Athenians who were not killed in the battle were enslaved and many worked to death in the quarries near Syracuse. This was an utter disaster for the Athenians and they were now practically defenseless before the Spartans and their allies. Plutarch stated that when news of the disaster reached the city, the citizens at first were incredulous and then began to panic. The Spartan’s had once again invaded Attica and were camped within miles of the city. The Syracuse Navy was sent east to help the Spartans to defeat Athens. It seemed that the Athenians were on the verge of defeat. News of the Sicilian disaster encouraged many of the cities and islands in the Athenian Empire to revolt. However, by a superhuman effort, the Athenians continued with the war against Sparta. Private citizens donated their wealth to the city and the funds were used to build new ships. The citizens also enlisted in the army. Despite the odds, the city survived. It did this by once again returning to the cautious strategy of Pericles. The Athenians to the amazement of all Greece survived. Athens was hobbled by the Sicily Expedition. Instead of keeping Sparta at bay, the City struggled to defend itself foreign powers. The Navy was permanently damaged by the loss of its fleet outside of Syracuse. The Athenian army and navy never returned to their previous numbers and in future conflicts they were almost always outnumbered. If the city had not suffered such heavy losses in Sicily, it seems unlikely that Sparta could have ever defeated it. The economy was crippled by the Sicilian expedition and the Athenians were forced raise special taxes to defend itself. Gradually, over time, the ability of the Athenians to finance their war with Sparta was greatly curtailed. The Athenian Empire was not doomed by the defeat outside Syracuse but it made it more likely. Athens did secure some victories but by 404 BCE the city was left at the mercy of its enemies after the Spartans, with the help of the Persians, shattered the Athenian navy at the Battle of Aegospotami. Sparta and its allies besieged Athens and it was forced to surrender. The heyday of Athens came to an end. The Athenian defeat in Sicily not only weakened the city militarily but also politically. Many of the traditional elite and aristocracy of Athens were never thrilled democracy. They wanted a return to the previous oligarchy which would return control of the city to their hands. They attributed the defeat to democracy and they believed that the city could only be saved if Athens changed its form of government. These elites were angered by the fiscal strain caused by Sicilian expedition. In order to defend the City, the Athenian government began to tax the wealthy to such an extent that some people were left penniless. This caused great resentment among the old aristocracy. However, the democracy was still supported by the mass of citizens, especially the hoplites and the oarsmen. 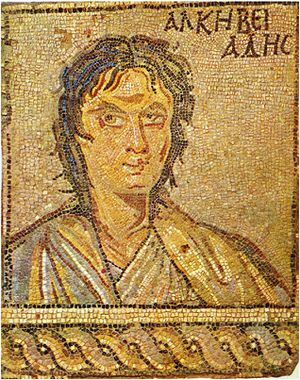 Alcibiades and others became involved in a plot to oust the democracy. 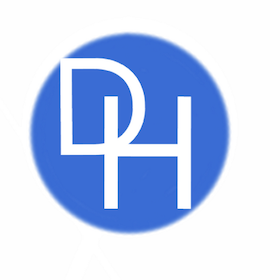 During a difficult time for the Athenians, the plotters took their chance and seized power from the democrats. The oligarchy was known as the 400 and it ended the radical democracy in the city. They did continue the war, even though many of them were secretly pro-Spartan. The oligarchy was divided and it was succeeded by a more moderate form of oligarchy government the 5000. The Athenians all the while continued their war and after a victory at the Battle of Cyzicus took place in 410 BC, when an Athenian fleet destroyed a Spartan navy. This led to a backlash against the oligarchy and it soon fell and was replace, once more by democracy. The disaster in Sicily was to exacerbate political divisions in Athens and led to great political instability. This was to undermine the Athenian efforts in the war. For example, it failed to capitalize on its great victory at Cyzicus. The aftermath of the Sicilian Expedition was politically divided Athens that struggled to unite to defeat its enemies. The Peloponnesian War was a terrible defeat for Athens. It was never again to be a great political force in the Greek world and beyond. The war had for many years gone well for the Athenians and by the time of the Peace of Nicias, it could even be said to have won a strategic victory. However, this was all to change after the Sicilian Expedition. It was a foolhardy and poorly planned invasion. It probably never had a chance of succeeding. The expedition was an unmitigated disaster for the Athenians and it weakened their army and navy. They were never as militarily powerful again. They did manage to continue the war but it was clear that they were always going to be on the defensive after Sicily. The expedition left the city militarily weakened it also weakened it financially. This led to heavy taxes that provoked a coup and government by an oligarchy. Athens was destabilized by the disaster in Sicily and this was a factor in its defeat. The Sicilian Expedition was the beginning of the end for Athens and her Empire and ensured that she would ultimately be defeated by her enemies.